Another fantastic submission and great use of some green LEDs. Thanks to Alex B of Rockville, MD, for this submission! "My LED kits arrived today, and less than 15 minutes after opening them, I had them installed in two of my HO pieces of rolling stock. I am really pleased with how simple it was and how good they look. I’ll be writing a product review for our local NMRA division’s newsletter about this with a link to the many offerings on your website. So thanks again." This small sand house was used to keep sand dry for use in locomotives. 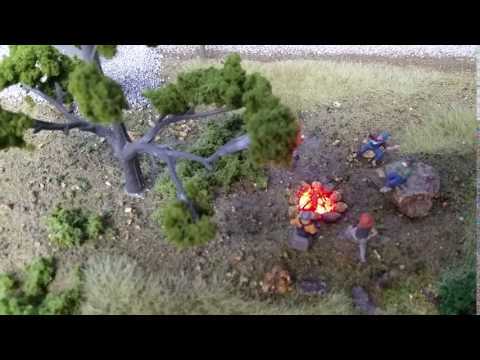 Our customer used this Kibri kit because he models German railways along with our 3v warm white nano mounted on scale lumber. 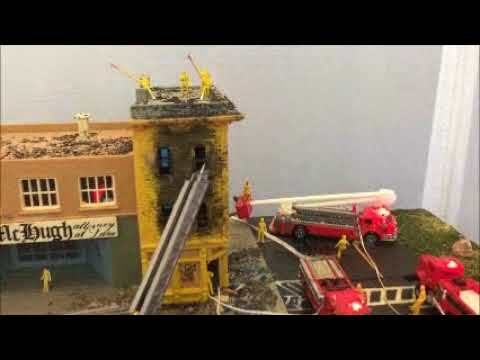 Our megas look great in this Lionel floodlight tower! 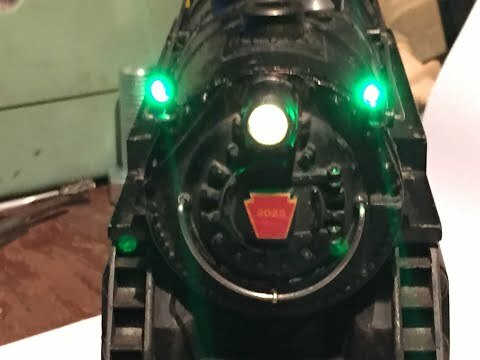 Another successful project completed using our rectifier and LEDs on Jim Burns' Postwar Lionel 2025! Two green SMD LEDs are used in the classification housings, and a 3mm warm white LED was inserted in a hole drilled in the back of the lens. Jim says, "Thanks again for a great product!!" Thanks for submitting this informative video! Paul used a 26-light string in 4 colors to light his cottage. "Very nice. I wish I had better means to take a decent photo. They look really nice in the dark." We think they look great, Paul! This N-scale refinery was updated with a new coker unit. Every LED in this scene was purchased direct from Evan Designs! 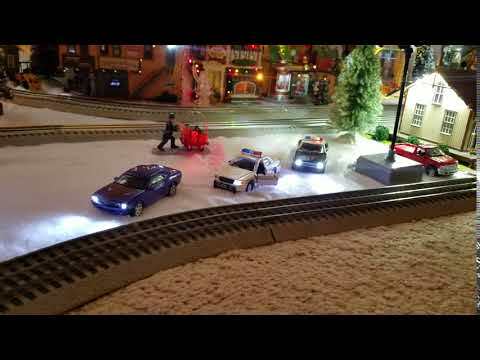 This N-scale FP7A uses a 1.8mm warm LED for the top light and a custom harness made by Evan Designs. The harness has a 1.8mm LED in warm white for the lower, large light and two warm white picos for the ditch lights. "I love your lights, and when you combine them with a decoder ... well, there isn't anything better!" Thought you might like to see where we are at now. Lots of your lights. You were right – the flicker died out after a short time. Thanks again for all your help. Attached is the photo I promised – hope you can use it in your gallery. 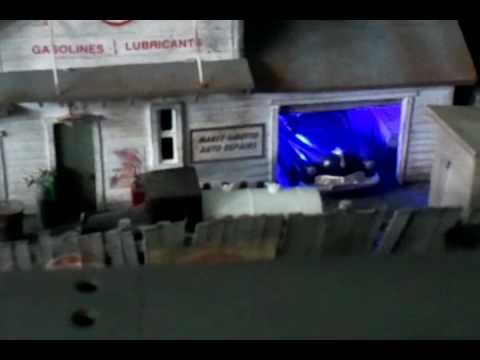 I wanted to thank you for helping my project with my special order LED string for my N scale dome car. Here are the results and I’m very happy with how it turned out! I appreciate your prompt and accurate service. The above pictures are an N scale FP7A using a 1.8mm warm single led for the top light and the new harness set up you made for me with a 1.8mm warm lower large light and two warm pico's for the ditch lights. I love you ligts and when you combine them with a decoder .... well there isn't anything better! Here is a new version of the TTrak Module with 14 flashing pico LEDS. I am finding this is REAL had to take photos of. When the LEDS come on the camera light sensors so nuts. In the first video I sent you the lights looked red. Now using the same camera they have a white appearance. Anyhow, you have my permission to use either this video or the old one any way you wish. If I figure out a better way to do it I will send it on. 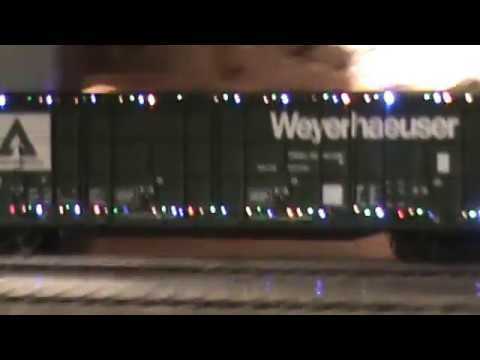 I am working on a magazine article for N Scale Railroading on how to install these LEDS. I was going to scan in the little card you send me showing the different sizes of LEDS. May I have your permission to print that? Once I learned the tricks of installing these it was easy. Pico is absolutely the right size for N Scale vehicles. Attached are pics of the refinery I recently completed. 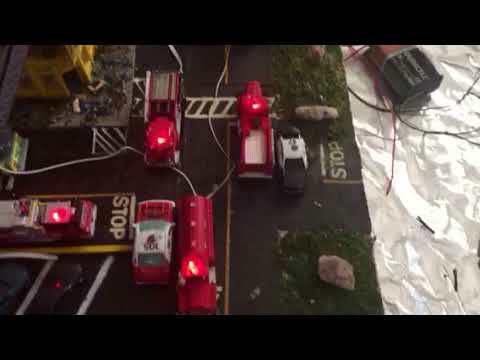 The "fracking tower flare" I created using the "flame" LED units. Feel free to use these on your website if you'd like. Almost all of the projects on my 20' x 40' layout (n-scale) received LED lighting ...thanks to you for power and lighting resources. And as I'm often told,......as good as the layout is,.......it's the lighting......that's the "magic" and brings it all to life. I paid for the new order. Most of this order is already committed to current projects. I am working on my RS11 that I last worked on in 2009. I removed brass tubes I was using as BULB holders since I am using LEDs now. These are all your LEDs. I had to fiddle with the 1 that is out. All is good now. Flickering fire video using Evan Design LED lights. I am a satisfied customer that has about 35 Ross switches on my layout. All of these switches use the DZ1000 switch machine with the #50 illuminated switch stand. Over 75% of the switches are at least ten years old and have operated fine since purchased. Recently I upgraded the switch stands and I thought that I would share the changes with you. I find these upgrades to be an improvement that you might want to consider for your product. The first paragraph below explains the reason for the changes and the remaining paragraphs attempt to explain the changes. Some of the more recently purchased switch stands had a problem with the wall thickness being too thin where the switch stand housing set screw presses on the turned brass rod.. (Note that you did send me a replacement for one or two of these, thanks again.) When the brass deforms it bends inward or breaks and of course the switch stand cover is now loose and does not turn with the brass rod as it should. Picture #0732 below shows one of these failures. A second issue with the older switch stands, which have been in use for multiple years, is that the grain of wheat bulb turns the green colored lenses to a rusty brown over time. (Note that I use approximately 12 volts to power the DZ1000 and the bulb, but I also use a resistor in series with the bulb to decrease the voltage to the light.) Finally, a minor issue, is that the switch stand housing becomes hot to the touch after it is illuminated for any length of time. To fix these issues I have installed EVAN DESIGNS 7-19 volt AC/DC/DCC Chip Nano Pico LEDs in the switch stand. Note that I have copied the supplier of these LEDs on this e-mail. The process is described in the following paragraphs. Step one is too straighten the deformed brass wall and fill the top of the brass rod with solder. Next a hole of the original size is re-drilled through the brass rod. Finally I enlarge the hole in the brass rod with a .0625" diameter drill. Picture #0734 shows the final result. These processes provides ample thickness for the set screw to clamp on the rod. The increased size allows for easier insertion of the LED. Also note that if the original brass rod was machined with the .0625" size hole and the large drill diameter on the top of the rod is eliminated a machining step would be eliminated in the manufacturing process. Next the LED is inserted with two pieces of shrink wrap tubing. See picture # 0735. The two pieces are heated and shrunk to form a step as seen in picture #0739. The lower piece of shrink wrap slides into the hole up to the step. I use a tiny tiny amount of super glue on the shrink wrap when I insert the LED and wires into the brass rod. This makes the LED rotate with the brass rod. See picture #0742. Finally the housing is place on the brass rod and the switch stand is installed on the switch. See pictures #0746-0748. I hope that this information is helpful to you and might provide the steps to improve your current switch stands. Feel free to e-mail me or call me at 906-635-9553. Thanks again for a great product and note that I have been very pleased with the LED products from www.modeltrainsoftware.com. Thanks finished the 2nd switch tower with 4 leds. I used up the first order. Need to restock. Jack Fisher has added a new level to fire LED's. Tankers using Evan Designs LED lights. It was a fun project to put together and the kids are really getting a kick out of it. It took a little over 18 hours as near as I can figure to make over 230 holes using a pin vise, thread and bundle fiber optic cable, then attach to the flashing LEDs I ordered from you. Used Evan Design LED lights for this project. 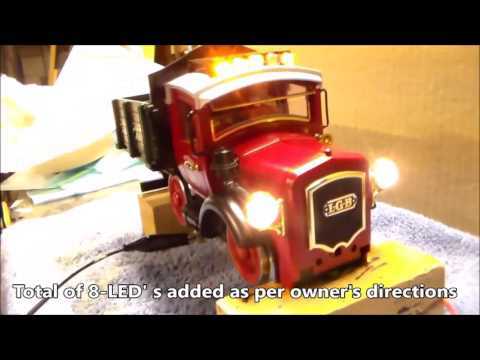 This video is about Santa Layout 2016 1 using Evan Design LED lights. Here is the finished scratch buildt signal tower. The only thing that isnt the sign arm hanging off the hand made street light. It fit well and i used it. There are 3 LEDs on this structure. The street light warm white. Inside the tower control room warm white and 1 amber LED under the roof soffet for accent. The bricks and roof were taken from the internet resized and printed and applied with watered down elmers glue to apply and then on the outside to seal. It started out as just for fun then got serious lol. All because of your LEDs. Thanks and the mail female conections are great for using a 9 volt for portability and also for just pluging into the 19v track power on the layout. I hope to do much more business with you. Great products, Great service. Friendly Staff. First G-Scale piece I've been asked to light. Originally, it had no lights at all. Owner specified what he wanted. Has since said he probably should have gone with red and green flasher atop the cab. Here it is lighting underside of the icing dock--nice even lights purchased from Evan Designs. And here are two of the color-changing LEDs purchased from Evan Designs. Assume you catch the import of the place name. Having creative fun! Headlights are two 1.8mm LED'S with 1.5mm fiber optic cable. Ditch lights are pico LED's. All are warm white purchased from Evan Designs. Working on switching a five-car MTH set of El Capitan 15-and 16 inch aluminum cars from lamps to LEDs. Also installing a bridge rectifier and capacitor in each to virtually eliminate flicker as the pick-ups encounter inevitable breaks in the track. I also just shot a new portrait of 5495 with the new LED headlight. I am in love all over again! Car using Evan Designs LED lights.